Diane von Fürstenberg breezed through Dallas a few months ago in celebration of her iconic Wrap Dress. It was the hottest thing around in the 70s, fell out of favor (but not production) in the 80s but has made a comeback in new millennium! Next year, the wrap dress will celebrate it's 40th year in production. Something that's never happened before. Sure, Coco Chanel invented the concept of the little black dress, but it was never about one dress. 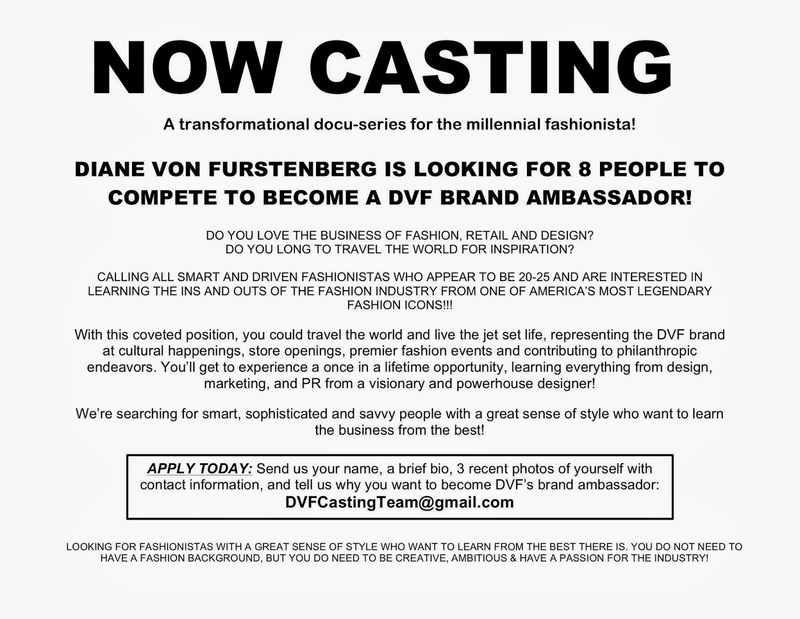 This iconic designer is currently conducting a nationwide search for eight ambassadors (ages 20-25) to "travel the world, live the jet set life" and represent the DVF brand. I can't think of a better mentor to "learn the ins and outs of the fashion industry" from. If you would describe yourself as "smart, sophisticated and savvy... with a great sense of style" then give it a go.